Last night I participated in a Facebook live session with my Moonshine class and teacher Effy Wild. One of the topics was grief and how we as a culture tend to shove it into a nice, neat little compartment. I totally agree with this, and I could write pages on grief from the death of friends and family, grief from divorce or other loss of relationship, grief from loss of home, grief over the loss of a pet (I’ve cried more over the death of my dogs than over breaking up with my fiancés. And yes, that’s plural), even empty-nest syndrome, which is a bittersweet kind of loss. However, the grief I want to explore is one I think that is especially taboo. It is the grief we experience as we grow older and realize we are mortal, that we can no longer do the things we used to do, and that we are in danger of losing our independence because of illness, frailty, or finances. I imagine that different people confront these feelings at different ages. No one really talks much about it, and there really isn’t a lot written about it that I’ve found. Even seniors themselves avoid talking about it in a deep way, but I am convinced we all have to deal with it at some time. Some people deal with it at retirement, and others when they get a serious illness or when a spouse or significant other dies. For me, it was right around the time I turned sixty-five, which was the age my father died. It was then I realized I had outlived my entire immediate family–my parents and my siblings. Not a long-lived family, I realized I could die of a heart-attack any day. I began to get very jealous of my time. There were other signs of my aging that were creeping in as well, and I am sure they added to my feelings of mortality. I am not sure if I went through the stages of grief in the traditional order, but I think the journey was very like the stages and gradually led me to acceptance. By the way, I was not really afraid of death. I was afraid of dying. There is a difference. It seems to me society tries to make getting older some wonderful, happy place, and it is. But so is young adulthood and so is middle-age. We don’t deny the problems that go with being a twenty-something or a middle-aged person. We need to acknowledge both the advantages and problems of elderhood as well. I am happier now than I’ve ever been in my life. I wish I could still walk three miles without feeling like my psoas muscle is going to lock up, and I’d like to have my thirty-year old body and still be able to eat pizza or burgers and drink beer every night. But my understanding of who I am and what I want is closer to being spot-on than it ever has been. That’s not a bad trade-off. I just turned sixty-eight. I’m in a much better place than three years ago, but it was a hard pull up the road. Now, I am enjoying being a crone, and I’ve even resolved to enjoy my eccentricities openly. I realize that my senior friends who are dealing with aging with the most wisdom most often do it a bit tongue-in-cheek, and we appreciate those who can smile at the absurdity of life. We value the time we have left, and realize that life is precious. Now, I don’t do things unless I really want to do them. I don’t have time to do otherwise. I spend more time in stillness and in just enjoying the present moment than I used to. I paint nearly every day. I suffer fools a little less gladly, but I do worry it is because they are mirroring the parts of myself that I haven’t worked on, so I had better get busy with that. The recognition of others that I used to crave seems sort of silly now and too much work. I do like giving people massages. I still love rock-n-roll and sing in the car. I’ve found that helping people with grief, no matter where it comes from, is about listening. It is not about offering advice. Listening to someone talk about fears of their own mortality may be uncomfortable, but if someone shares with you, just listening is the best thing you can do to help the other person to move on. 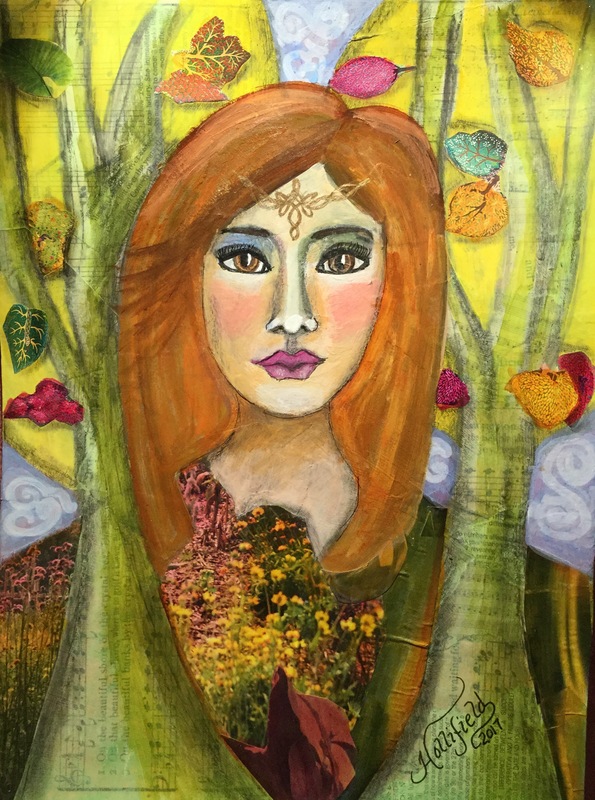 Yesterday I posted photos of two mixed media paintings I did in Andrea Gomoll’s Faceinating Girls Around the World class. It was a great class, and I took it for several reasons. First, I like Andrea’s style of teaching. She’s perky and explains what and how she is doing what she is doing with detail and enthusiasm. You can tell she loves what she does. Second, I wanted to practice using watercolor on portraits, and this class focused on skin tones for different races. I’ve done a class like this in acrylic, but watercolor seemed really interesting. Andrea was using Prima Watercolor Confections, of which I have several as well as all of the Jane Davenport watercolors. I printed the pigment sheets for both brands and substituted or mixed for the complexion colors if I needed to. I ended up ordering the Prima Complexions palette as it was easier to have it than to keep mixing. It turned out that I was really glad I made the purchase. While more experienced watercolorists can create flesh tones by mixing primaries and/or complimentary colors, I enjoyed having the premixed palette. Of course, these watercolors are not Daniel Smith quality. Neither are they Daniel Smith prices. They are around $24 for the palette of twelve half-pans. I thought they were good quality at a reasonable price. They had enough pigment to cover smoothly and were not overly grainy for portraits. They both blended and layered easily. Third, Andrea is really a mixed media artist. Although watercolor is her primary medium, she uses other media, too. She’s fond of stamping and has her own line of clear stamps that feature her signature cute girls. She uses stencils with both acrylic paint and modeling paste or gesso in her backgrounds. She is fond of bling in the form of glitter and sparkle gel. She always adds pen in the end. In this class, she used Pan Pastels to enhance the complexions of the girls. I didn’t want to shell out the bucks for Pan Pastels. I’ve lusted for them, but I don’t do enough pastel work to justify the expense. Fortunately, Jane Davenport has just introduced a Pastel Palette line, and I was lucky enough to find them on sale at Michaels for 60% off. Needless to say, I bought all four palettes, and since each has eighteen colors, I ended up with fifty-four pans of color. The JD Pastel Palette worked great. I don’t know how it compares to Pan Pastels, but for my purposes, I was quite pleased. They didn’t seem a creamy as Andrea’s Pan Pastels, but after I got the “new” off the top, they spread well. On the page, they added the color lightly enough that I could layer and not worry about ruining the piece with a streak of color that was too intense. Once I applied fixative, they stayed put. If you are on a budget like I am, I recommend you check the JD Pastel Palettes out. Michaels has frequent sales on them. You might get a deal like I did. You might want to go the Jane’s website as well. She has some great videos on how to use these and other of her products. Finally, I took the class because I wanted to work on my own style of faces. Andrea paints girls you recognize when you see them. I could name a hundred other artists whose portraits are immediately identifiable as their work. Some are whimsical; some are realistic; some are illustrative. I think I’m more illustrative, or at least that’s what I aspire to be. I don’t have the patience for purely realistic works, and I like cute girls. Real people are rarely cute. I love those old forties and fifties posters and ads when artists drew the models and actresses instead of photographing them. I wish I could paint like that. The books I go back to over and over are by Andrew Loomis and Jack Hamm. The hair is wrong, but I love their faces. I have real trouble with wonky-ness though. One side is always a bit off. Nevertheless, using the Prima Watercolor Confections Complexions palette and the Jane Davenport Pastel Palettes have helped me achieve my goal of creating my own style a little more I think. I recommend both products to you. Yesterday I wrote about getting ready for my first art exhibition and thinking about how to price my pieces. Our group, Uni4Artists, can submit thirty pieces, which means each of the members can submit two or perhaps three, depending on how many of us submit. This is an annual event at the Morganton Jailhouse Gallery and includes a reception and citywide art crawl. Last year, I was impressed by the turnout and by the art submitted by our members. In fact, I was humbled. As I’ve mentioned before, I started painting in 2016, after I moved my massage practice and needed something to put on the walls. My point is that I am a less experienced artist than many of the others in the Uni4Artists. While I know it is death to artistic expression to compare myself to others, I’m also aware that I need to be careful to neither overprice nor underprice myself. Likewise, I have very few pieces that are truly original. I am sure I suffer at least a little from being overly attached to the pieces I think are worth submitting, and I’m trying to be mindful that I may not able to evaluate their value accurately. To my credit, I’ve asked for help. The show last year got me thinking about originality and the point at which you stop feeling like a student and start feeling like an artist. All my classes have been online, and except for a few dud teachers in some collaboratives, I’ve learned a great deal from all of them. In the beginning especially, I did a lot of copying, which is an excellent way to learn, but you can’t sell paintings you’ve copied from a teacher, no matter how good they are. While I was copying for the most part, I felt like a student, and I resisted venturing out on my own. Some of my excuses were valid; some were born of fear of failure. Dark-skinned African-American girl and Native American girl for Faceinating Girls Around the World, a class taught by Andrea Gomoll. I copied her techniques for skin colors and layering of watercolors and some of her mark making and background design techniques. I tried to make the look of the girls my own. However. I would not feel comfortable selling either of these pieces, but I do feel like I got good practice. Toward the end of last year, I decided not to sign up for so many classes and to really work on developing my own skills and style. This year, I’ve spent a lot of time with watercolors, a medium that until now I haven’t really enjoyed. I’ve also spent more time painting flowers and animals. I learned last year that I like story art, and I like combining nature and people. Although I miss some of the teachers and fellow students with whom I’ve traveled these last few years, setting my intention to develop myself as an independent artist and working toward that end feels right. I’m dreaming of the day when I will have trouble deciding which of my many originals I might want to submit for exhibition. I already feel like an artist. Last year I was invited to join a local art group named the Uni4Artists (the Unifour is what we locals call four of the adjacent counties that make up our cultural/geographic/economic area). The artists in the group create in a variety of mediums, and I’ve enjoyed our meetings a great deal. I still feel like a newbie, but I am getting more comfortable. The other artists are warmly welcoming, and because we alternate meeting locations between three venues, including a museum, a gallery, and a teaching studio, I’m exposed to a variety of professional and student art. One thing the group does is participate in at least two shows in which artwork may be sold. I had no idea that galleries were so strict about the criteria for submissions. For example, last year, I didn’t submit anything because all paintings had to be framed, and they had to be wired for hanging, Gator hooks were forbidden. Who knew? Over the past year, I have bought some frames, and I’m now watching YouTube for instructions on how to make exhibition-ready pieces. Most of my acrylic pieces are not varnished, which I’ll have to do if I decide to submit one of them. The piece I’m using as a logo for this blog is a possibility, but I won’t submit it without doing some more work on her nose and eyes. I can do noses better now, and this one is too wide. The eyes aren’t sparkle-y enough either. They aren’t alive. I’m glad it isn’t varnished yet, but time is wastin’ if I’m going to use this piece. On one hand, I’m excited to be putting pieces of my art in a show. Even if it doesn’t sell, it feels like I’m really able to call myself an artist. On the other hand, I’m truly nervous about getting the details right. Of course, it won’t be the end of the world if I don’t. Let’s get this in perspective, Suzanne. The worse that can happen is they won’t hang my pieces. But somehow, knowing how to prepare and price my art seems like the final piece of really calling myself an artist. I’ll be sure to let you know how it goes. 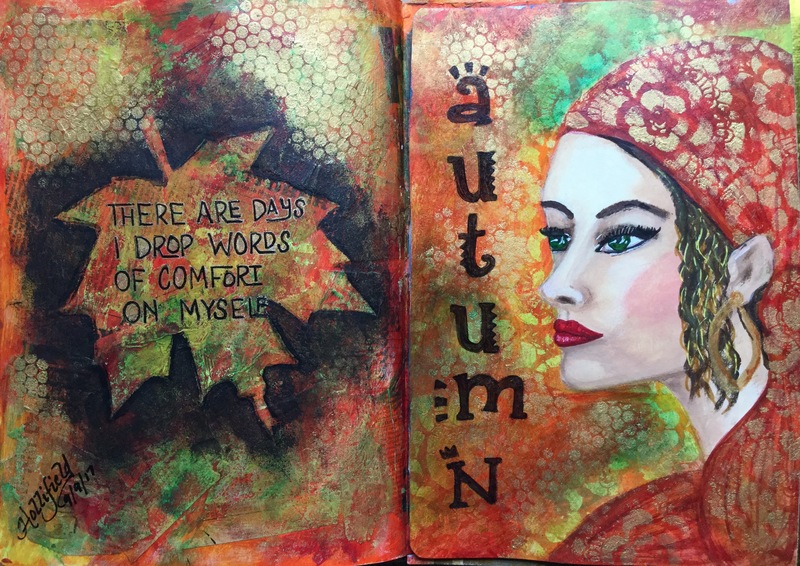 I started this blog because of a challenge in 2017 from one of my online art teachers, Effy Wild, who is a master of art journaling. Twice a year, in April and September, she challenges her students to blog along with her every day for a month. It is truly a challenge for me because although I used to write all the time, I am finding that as I grow older, my right brain is becoming more and more dominant, and my left brain doesn’t really want to form logical paragraphs. I’ve been thinking I should start writing in this blog if for no other reason than my art has improved. I was actually shocked to see how long its been since I’ve written anything- shocked and a little embarrassed. I can do better that this. Suzanne Hollifield original watercolor for a class taught by Ildiko Karsay called Nature Art, Spring 2019. Indeed, my art has improved. I’ve become independent, and I’m using more mediums regularly. If I copy now, it is so that I can learn instead of because I can’t produce anything of worth on my own. That’s been both liberating and satisfying. I’m learning to use Photoshop to combine elements of reference photos, and I am using collage in the same way. I’m painting flowers and animals as well as faces. I’m happy. Sometimes I will hear teachers talk about how art helps with getting the pain out on the paper. This is true. I have certainly worked through depression and anger by arting it out. However, more often painting is pure joy for me. I don’t really care if others like it although I’m happy when they do. It’s just that when I paint an apple and it actually looks like an apple, or I do a pastel owl that is delightfully quirky and fun, I feel joy. I have lots of my paintings in my home. They make me smile. Undneath some of them, especially the art journals, are some writings where I poured out my soul, but always by the time the last of the paint dried, I felt happy. I encourage you to try to draw even if you think you can’t. Start with stick people or cartoon people. Lots of folk art looks fairly simple in style. It is the joy in the painting that make it worth something. Do it for fun. If you can’t do that, buy a coloring book. Give up that idea that you aren’t artistic. It just isn’t so. You might find joy is as nearby as your pencil. I used to keep a written journal every day. In fact, I’ve got boxes of them taking up space in a closet. When I taught high school English, every class started with ten to fifteen minutes of the students free writing, which I never read. The point was to develop fluency, to support thinking in words instead of images, and to develop a writing practice that just might carry over to life after school. At some point, however, I began to write less and less. It wasn’t that I had nothing to say, it was just that after I retired from teaching and especially after I stopped dating on a regular basis, I had less drama in my life and so less need to bare my soul on paper. When I began painting two years ago, I began to write again more regularly. At first, I only wanted to document my learning process, and then I started taking classes that encouraged self-reflection before picking up the brush. 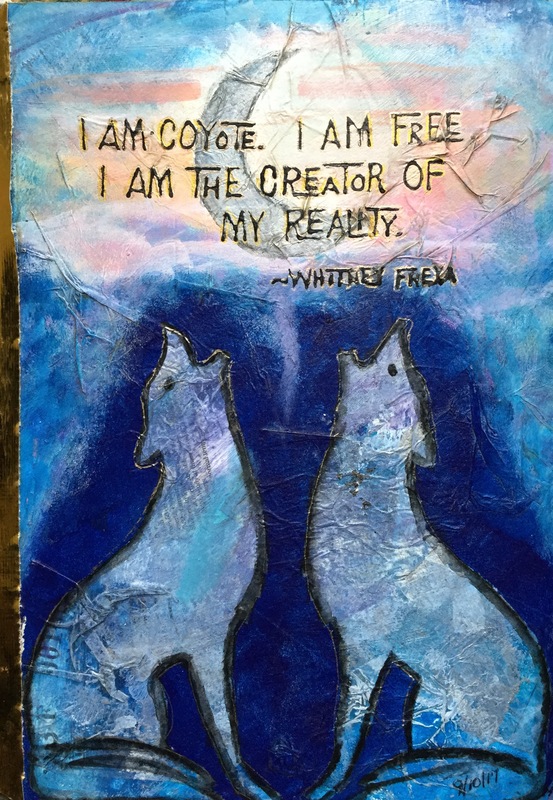 I used the prompts supplied to me by my teachers, initially by Kelly Rae Roberts in her Spirit Wings course to create mantras for the paintings and then by Effy Wild in Book of Days, a year long course that comes with a prompt for every day. The fact that I often painted over what I had written gave me a freedom to express myself without reservation. Over the last year, I’ve strayed from the prompts more as world events have challenged me to think about where I stand on certain issues. I often feel the stress of my values in conflict with those of people I love or care about, and although I am aware that nothing will make me stop caring for certain people, I wonder if we might become estranged by events if push comes to shove. I made a commitment several months ago to read the words of great leaders like Mohandas Gandhi and Dr. Martin Luther King, Jr. when I get really upset with the way things are going in the world. I have also started listening to podcasts that either explain events or that offer a positive viewpoint. They help me stay rational and positive rather than reactive and fearful. One podcast that is just back from hiatus is #ReikiRadio, which you can find on Blog Radio or on iTunes. It is hosted by Yolanda Williams. She spoke on a recent episode about how during the last year many people have been dealing with the Shadow, and she indicated that our country might also be dealing with its Shadow. I’ve been thinking about this ever since I heard it, and I’m sure it will provide days of fodder for my art journal. If you are wondering how that works for me, I usually write on the paper; then I either paint over it or glue collage piece over it. I have, on occasion, torn the writing and used it as collage pieces. 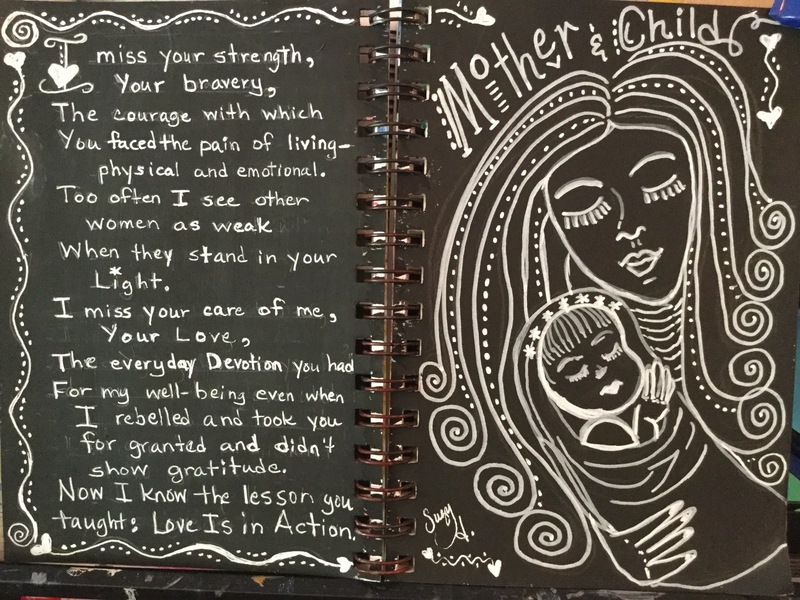 (I’m thinking of doing this with some of those old journals.) in this way I get my feelings out, and then make something beautiful out of the pain or anger or frustration I’ve expressed. 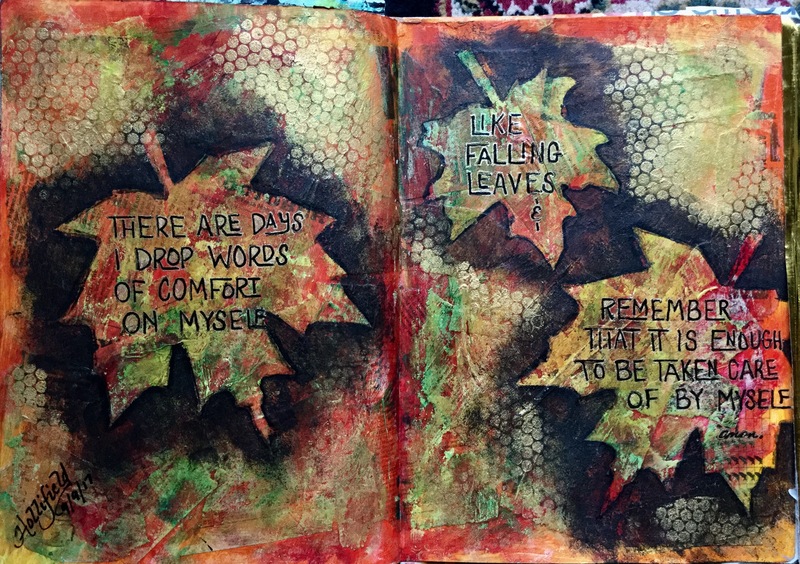 Another way to art journal is simply to make the writing a part of the page itself as in the two pieces here. Sometimes, I just use a poem or a quote that is meaningful to me. Recently, I’ve been using music as a jumping off point, thanks to a class I’m taking called Mixed Tape II. 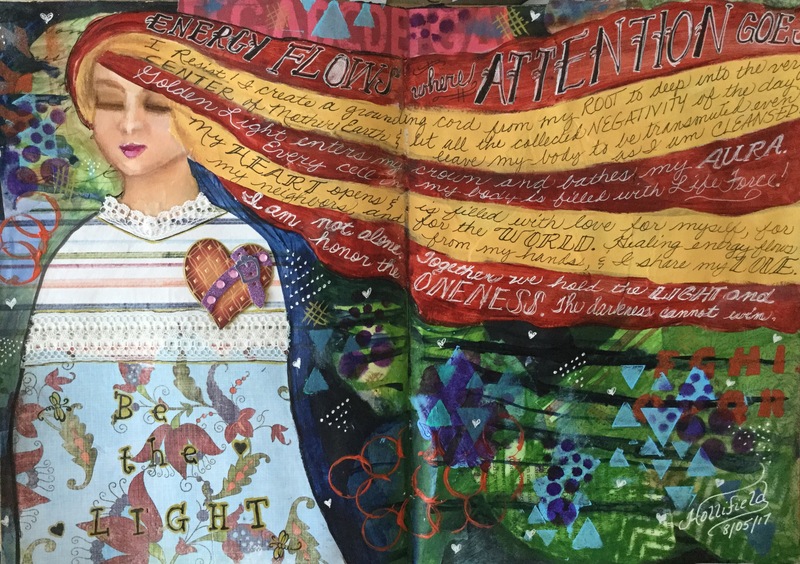 This is not to say that I never save things I write anymore, but art journaling has given me a way to express the irrational and the confusing parts of my mind and heart without judgment. It is surprising to me how often simply doing that finds a resolution that all the self-analysis of previous years did not. Besides, I get to paint. The last four dogs I’ve had were adults. I haven’t had a puppy since I was only a little older than a puppy myself. When my cocker spaniel/poodle mix, Benji, died, I knew I wanted another dog, and I started looking almost immediately even though I was aware that I needed time to grieve before bringing a new dog home. Still, looking seemed to console me. I’d felt so much guilt when cancer took Toto, my dog before Benji, that I waited years before getting another dog. I didn’t want to wait that long again. I immediately decided I wanted a rescue dog. I didn’t have the time to train a puppy, and puppies have so much energy! I knew I wanted another adult dog, preferably one who had already been housebroken. I went online and to the newspapers to find out what dogs were available at the Animal Shelter, the Humane Society and at the rescue organizations. If you go online to www.petfinder.com, you can type in your zip code and then go from there. It will ask you what type of pet you want (cat, dog, snake, rat, etc.) Then, you can pick size, age, breed, and other relevant details. The search engine will show you all the animals within your parameters in an increasingly larger radius from your home. There are other engines, but this is the one most shelters use, and it is the most complete, in my opinion. I also visited the Humane Society and went to Pet Smart on Saturdays when they have rescue organizations set up inside their store. Meeting and holding the dogs helped me realize I wasn’t yet ready. I still needed to grieve for Benji. When I finally met Gingersnap and held her, I knew she was the one. I had called the rescue group, SCRATCH, because I saw a Yorkie online. Gingersnap hadn’t been put online yet, but the rescuer offered to meet me and bring Gingersnap along. It was a perfect match. She was just right for me. I kept Gingersnap for seven years. She was a sweetheart, and when she died of kidney failure, I again went to www.petfinder.com and found my next furbaby, Pearl. She was at the Catawba County Humane Society. Why do you want a pet? It’s amazing how many people fail to ask themselves this simple question before they get a pet. Adopting a pet just because it’s “the thing to do” or because the kids have been pining for a puppy usually ends up being a big mistake. Don’t forget that pets may be with you 10, 15, even 20 years. Do you have time for a pet? Dogs, cats, and other animal companions cannot be ignored just because you’re tired or busy. They require food, water, exercise, care, and companionship every day of every year. Many animals in the shelter are there because their owners didn’t realize how much time it took to care for them. Can you afford a pet? The costs of pet ownership can be quite high. Licenses, training classes, spaying and neutering, veterinary care, grooming, toys, food, kitty litter, and other expenses add up quickly. Are you prepared to deal with special problems that a pet can cause? Flea infestations, scratched-up furniture, accidents from animals who aren’t yet housetrained, and unexpected medical emergencies are unfortunate but common aspects of pet ownership. Can you have a pet where you live? Many rental communities don’t allow pets, and most of the rest have restrictions. Make sure you know what they are before you bring a companion animal home. Is it a good time for you to adopt a pet? If you have kids under six years old, for instance, you might consider waiting a few years before you adopt a companion. Pet ownership requires children who are mature enough to be responsible. If you’re a student, in the military, or travel frequently as part of your work, waiting until you settle down is wise. Are your living arrangements suitable for the animal you have in mind? Animal size is not the only variable to think about here. For example, some small dogs such as terriers are very active—they require a great deal of exercise to be calm, and they often bark at any noise. On the other hand, some big dogs are laid back and quite content to lie on a couch all day. Before adopting a pet, do some research. That way, you’ll ensure you choose an animal who will fit into your lifestyle and your living arrangements. Do you know who will care for your pet while you’re away on vacation? You’ll need either reliable friends and neighbors or money to pay for a boarding kennel or pet-sitting service. Will you be a responsible pet owner? Having your pet spayed or neutered, obeying community leash and licensing laws, and keeping identification tags on your pets are all part of being a responsible owner. Of course, giving your pet love, companionship, exercise, a healthy diet, and regular veterinary care are other essentials. Finally, are you prepared to keep and care for the pet for his or her entire lifetime? When you adopt a pet, you are making a commitment to care for the animal for his or her lifetime. The Humane Society acknowledges that this is a long list of questions, but it will help you decide if adopting (or buying a pet, for that matter) is right for you. Furthermore, many of the animals at shelters have already had a hard time of it. They need someone to be their person who will love them and care for them everyday for the rest of their lives, not someone for whom owning a pet was just a whim. In fact, it is because someone got tired of the responsibility that many animals are in the shelter. For example, my Pearl is a Boston terrier/poodle mix of a Bossipoo. I know because I had her DNA done. She had so many allergies, I needed to know if they were breed specific. I feel sure that the costs of her medical care are one reason she was surrendered. Unlike, Gingersnap, she had not been abused. Indeed, she has a really sweet personality, but she has to go to the vet at least once a month for allergy treatments, or she licks her fur off and scratches her ears until they bleed. So don’t make the mistake of adopting just because you think a pet is cute. Think about why you are adopting before you adopt. If you are ready to commit your time, money, responsibility and love to a new pet, you are going to be rewarded with joy and unconditional love. Animals are often spiritual teachers. They take you as you are and love you for what you are. They don’t care about your money, your looks, or your reputation. That is their blessing to you. This story was originally written in 1993, when I was a participant in the Appalachian Writing Project, a part of the National Writing Project, at Appalachian State University. It features my sister, Dawn, who died nine years ago this month and who was my best friend. I am happy that the story will be out here in cyberspace and not lost to the world when I die, too. It is a tribute to her and to my also deceased father. I despise getting up in the morning. After I get up, I’m fine. It’s the opening of the eyes, the moving away from warm comforters into chilly space, and especially the interruption of interesting dreams that I can’t stand. My sister Dawn and I share this aversion to getting up. We’ve discussed it at length as we’ve grown older, especially since it seems to annoy our families, friends, and employers so much. We’ve decided that it was our father who made us so passionately hate waking up. Dawn and I always slept together. I think it made us friends. Having the common enemy of our Daddy and his wake-up antics made us grow even closer. Daddy was not content to simply touch us or shake us or in some way to gently arouse us from our dreams. No-o-o. He had already been up an hour or so, spending quiet time drinking coffee and talking to my mother. By the time Dawn and I needed to wake up, the caffeine and nicotine had kicked in, and one of his diabolical plans to scare the slumber from our sleepy heads had blossomed. Sometimes he’d just blow in our ears or kiss our noses. Other times his idea of a good wake-up strategy was to turn on the lights and jerk the covers off us; he especially liked to do this on cold winter mornings. One of his best tricks was to get a broom straw or a feather and tickle our noses or our feet. Once, he blasted us out of bed by turning the stereo and “Purple Haze” on full volume. Dawn and I fought getting up. Every morning we hated that man and his “Wake up, Honey” or “Get up, Sweetheart”. We would hang on to each other, kick, whine, and growl. We kept our eyes shut tight. Sometimes he would leave, and we could go back to sleep a few minutes. Our peace was always short-lived. He was a terror in the morning. I’m forty-one years old now. I haven’t lived in my father’s house in twenty years, but every morning, I fight waking up. I have a clock, a clock-radio (full-blast), and a wake-up call for which I pay fifteen dollars a month. I can sleep through all of them. When Hurricane Hugo woke me, I walked to the door, looked out, drank a glass of tea, and went back to sleep. After all, what could I do about the forces of nature? I’d love to be one of those people who wakes up early, watches the sunrise, washes a load of clothes, is never late for work— you know, all those things early risers celebrate. But I know I’ll always have those blankets pulled tightly around me, struggling desperately to shut out the world in favor of my dreams. The prompt for day fifteen of the Artfully Wild Blog Along is to share something about myself that is not widely known. For most of my adult life, I have been captivated by the Arthurian legend. During my early teaching career, I was a certified exceptional children’s teacher. However, my undergraduate degree was in secondary English, so to earn extra money in the summers, I taught sophomore English in summer school, which lasted six weeks. Before NC changed the tenth grade curriculum to world literature, it was a survey literature curriculum and included selections from the Arthurian legend by Malory, Tennyson, and T. H. White and also had in the textbook the short novel by Mark Twain, A Connecticut Yankee in King Arthur’s Court. I also showed clips from a half dozen or more films of the story, including Knights of the Round Table, The Sword and the Stone, A Connecticut Yankee in King Arthur’s Court, Excalibur, Camelot, Monty Python and the Holy Grail, and an outstanding British film with very authentic costuming called The Legend Of King Arthur, which I found today on YouTube, although the quality is very poor. I fell in love with this ancient story, which has been told and retold over so many centuries in so many variations. I probably own close to two hundred books based on the legend. Most are novels, but some are history or literary criticism, and there are quite a few that relate to the story and its offshoot, the legend of the Holy Grail, as a path to enlightenment. Both stories are examples of the hero’s journey and are metaphors for the unfolding and development of the Soul as it gains knowledge/wisdom. There are even magical societies with rituals based on one or the other of the legends. The troubadours of the Middle Ages kept the stories alive throughout Europe, and even in countries far removed from Britain, there are versions. The Church might have liked to squelch the legends as too pagan or too gnostic, but it contented itself with Christianizing the primary elements. If there was a real King Arthur, he probably was a Celtic warlord, perhaps with Roman ancestors, living on the western coast of Britain during the time the Angles and Saxons were settling the east coast. Roman influence still existed, but Roman soldiers had gone back across the channel to defend the continent against their own Germanic invasions. The best modern retellings, in my opinion, are set in this period of the late Roman/Dark Ages rather than the later Middle Ages when the stories became popular in the French court. I could go on and on about aspects of the legend. That I have this obsession and have read so very many books of all different types about the legend is something very few people know about me, and even fewer are interested in learning. Indeed, I miss having a classroom full of sixteen year-olds who are, so to speak, a captive audience. My favorite retellings of the legend are Marion Zimmerman Bradley’s The Mists of Avalon, Mary Stewart’s four-book Arthurian Saga, and Stephan Lawhead’s six-book Pendragon Cycle (I especially like the first book set in Atlantis). If you want a good story, give them a try or watch one of the many movies. There are several newer ones since my teaching days. I spent all this past weekend painting. I usually do some art every day although it may only be a sketch. I’ve only been painting for two years, and yet, it has become a necessary part of my life. Most of the time, I can see that I’m improving, and even when I am not as happy with a piece as I might be, it is okay because I feel like I’ve learned something about composition or combining materials or any number of other things I can practice improving when I tackle the next piece. The inner critic is also called the superego. I was once in a spiritual group that did work on silencing the superego and was told that you could never really get to your True Nature as long as you listened to your superego; that is because the superego does not want your success but only wants to keep you down. Originally, some time in childhood, it may have begun as a voice that wanted to keep you safe, but it quickly turned into a voice to keep you subdued. You cannot escape the ego if the superego is constantly yapping in your ear. Painting puts me in a place where there is no yapping. What I don’t know is a challenge, and since my classes are all online, I can learn what I want. In fact, I can go back and repeat lessons that I really liked after my skill set has grown. Next year, I may do just that. I have signed up for more classes than I easily complete this year, but fortunately, I can download them or I have lifetime access to them. I plan to go back to some that I skipped and even to redo others. Next year, I will not need to enroll in so many online classes. I can live with that. I have finally come to a place where I feel like my own style is emerging. I am using Effy Wild‘s note taking strategies with the videos in my classes and doing my own paintings by synthesizing techniques I have learned whereas a year ago, I copied a great deal more. This way, I can skip lessons that don’t really appeal and still learn the techniques. I’ve stopped referring to myself as a student artist and started calling myself an artist. I have even made some notecards with prints of some of my work and sold a few in my massage office. So, I am going to keep painting every day, in spite of my yapping inner critic telling me to dust the furniture. It gives me pleasure. Furthermore, I live 43 miles from Huntersville and Donna Downey Studios. I live about 80 miles from Asheville and Alena Hennessey‘s studio. As soon as that car is paid off, my bucket list has a live class in Huntersville or in Asheville on the agenda. The dusting can wait.